Hard Rock Cafe Munich München. 3rd anniversary staff pin 2005 - staff. Mint condition - without original bag. Privatverkauf, daher keine Garantie und Rückgabe. 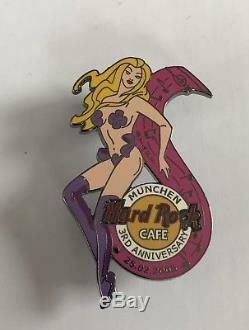 The item "Hard Rock Cafe Munich München 3rd anniversary pin 2005 LE Staff" is in sale since Saturday, July 21, 2018. This item is in the category "Sammeln & Seltenes\Pins & Anstecknadeln\Pins, moderne\Hard Rock Café". The seller is "droopey1311" and is located in Bischberg. This item can be shipped worldwide.